Univ Of Minnesota Press, 9780816692187, 256pp. Gender relations in Muslim-majority countries have been subject to intense debate in recent decades. In some cases, Muslim women have fought for and won new rights to political participation, reproductive health, and education. In others, their agendas have been stymied. Yet missing from this discussion, until now, has been a systematic examination of how civil society groups mobilize to promote women’s rights and how multiple components of the state negotiate such legislation. In Bargaining for Women’s Rights, Alice J. Kang argues that reform is more likely to happen when the struggle arises from within. Focusing on how a law on gender quotas and a United Nations treaty on ending discrimination against women passed in Niger while family law reform and an African Union protocol on women’s rights did not, Kang shows how local women’s associations are uniquely positioned to translate global concepts of democracy and human rights into concrete policy proposals. And yet, drawing on numerous interviews with women’s rights activists as well as Islamists and politicians, she reveals that the former are not the only ones who care about the regulation of gender relations. 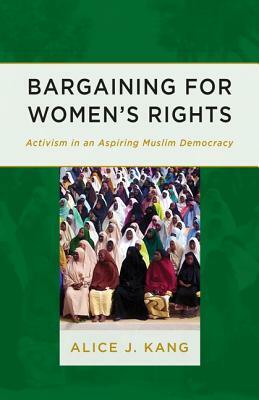 Providing a solid analytic framework for understanding conflict over women’s rights policies without stereotyping Muslims, Bargaining for Women’s Rights demonstrates that, contrary to conventional wisdom, Islam does not have a uniformly negative effect on the prospects of such legislation. Alice J. Kang is assistant professor of political science and ethnic studies at the University of Nebraska–Lincoln.